OTTAWA — The Liberal government lifted the veil on what it billed Tuesday as a bold plan to strike a blow against poverty across Canada by the end of the next decade — but the plan is absent any new spending or policy proposals that would help slash low-income rates by the year 2030. Instead, the 115-page plan provides a list of programs and policies the Liberals have enacted since coming to power in 2015, linking them to an ongoing federal effort to beat back poverty rates. The government estimates existing and planned social spending will lift 650,000 people out of poverty by 2019 over 2015 levels, and that by 2020, poverty rates would be 20 per cent lower than 2015 figures — roughly 900,000 fewer people living below the income threshold. The strategy document, entitled "Opportunity for All," promises a further cut over the ensuing decade, reducing 2015 rates by half by the year 2030 — a historic level that would equate to 2.1 million people having been lifted out of poverty over a 12-year window. "Those are targets the government can achieve in areas where they have jurisdiction, for example with seniors benefits and direct funding to families," said Tim Richter, president of the Canadian Alliance to End Homelessness. The numbers could go even higher if provinces use their policy levers in tandem with federal efforts, Richter added. Still, the goal would leave 2.1 million people in poverty by the end of the time frame, including just over 534,000 children under age 18. Anti-poverty group Campaign 2000, which advocates for an end to child poverty in Canada, said it plans to push for more ambitious targets. "I'm optimistic that we can build on what's in (the strategy) to make poverty history. This is a new starting point," said Anita Khanna, the coalition's national co-ordinator. "The real key will be having a new tool by which to hold the federal government accountable." What the strategy doesn't provide are new policies or spending beyond the $22 billion in new spending already in place, such as the Canada Child Benefit, or promised, such as a rent supplement or new benefit for the working poor. Leilani Farha, executive director of Canada Without Poverty, called the lack of new programs unfortunate, but said in a statement that the strategy "provides a solid starting point for our ongoing work" to alleviate poverty. Jennifer Robson, an expert on social policy from Carleton University in Ottawa, said on Twitter that the absence of new spending wasn't problematic: "This strategy names a goal and sets out a direction. What will matter is how government works with the many, many tools they have." The strategy also establishes a new tool to determine an official poverty threshold: the "market basket measure," first created by federal officials in the late 1990s. The government plans to introduce legislation this year that will enshrine the strategy's goals and the poverty threshold into law. Under the market basket measure, a family or person is considered to be living in poverty if they can't afford a basic basket of goods and services. The measure is tailored for 50 different communities to account for the difference in cost of living between cities. It doesn't, however, capture data for Indigenous communities and parts of the North, but the government intends to fill the statistical gap to better define poverty and track efforts to alleviate it in First Nations, Inuit and Metis communities. The strategy says the government should work to boost the share of income earned by the lower 40 per cent of earners "with more Canadians joining the middle class," which would partly require redistributing more wealth from upper wage earners down the income ladder. 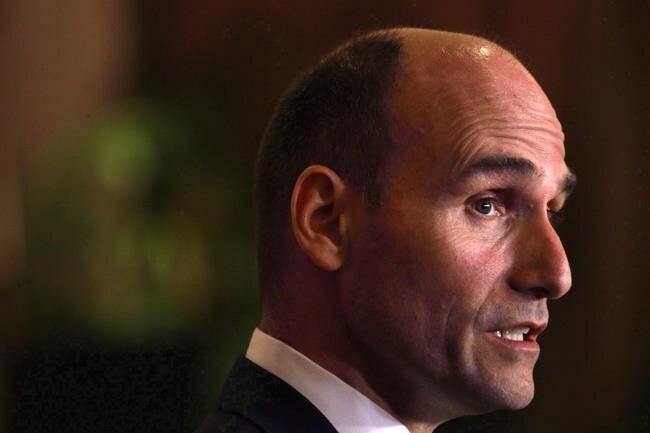 The share of income among lower earners is an important indicator of growth in the middle class, said Social Development Minister Jean-Yves Duclos, who predicted that the long-term success of the strategy would depend on the willingness of future governments to stick to it. "The other measures that future governments will want to take ... I believe will make the achievement of the 2030 objective feasible — still ambitious, but feasible," Duclos said. "And I would say realistic, if they keep the momentum that we've followed since 2015."